It would appear that together, hypnosis and NLP coaching is all about getting through the conscious mind to the unconscious mind, where suppressed, and other memories, are stored, to initiate the coaching for the best results. This in effect means that conscious participation is used to access and change the negative patterns which are buried in the unconscious mind. About hypnosis and NLP coaching. Hypnosis is a safe, natural state of enhanced mental relaxation during which time the mind is open to positive suggestions. Hypnosis is really a stepping stone to self-hypnosis, which many of us experience every day. Examples of trance-like states we achieve in the general run of things include being so lost in thought that sometimes when driving you go right past the street you want, or being so immersed in a novel or a TV show that you lose track of time. In the same way, hypnosis will give you the keys to achieve personal goals more easily by responding in a different way to triggers, which may have resulted in a negative response in the past. Hypnosis can give you the ability to access the problem issues and deal with them faster, easier, and more simply than before. NLP coaching is the applied approach of how you process information that comes from your daily life, relationships with others, and from your own thoughts. This approach is very useful for positive personal changes, because the way you think about your life experiences, has a huge impact on your behaviour as well as your communication with others. A combination of hypnosis and NLP coaching aims to help you let go of the past so that you can have successful and happy future. Some of the useful ways hypnosis and NLP coaching can help you. · Internal conflicts. There many times when you may do the opposite of what you really want to do, and have conflicting thoughts as to why this happens. Hypnosis and NLP coaching is able to access the unconscious mind where thoughts are formed, and guide you to carry out the decisions which are present in your conscious mind. · Imaging.Hypnosis and NLP coaching can help you to picture a better self-image than you may presently have of yourself, which leads to improved behaviour patterns. · Diet.Hypnosis and NLP coaching can also assist you to lose the desire for certain foods which may be harming your health, or causing you to gain weight. · Trauma.Emotional trauma and hurts in the unconscious mind which have not been resolved can be eliminated. Hypnosis and NLP can help you ditch all the old heavy baggage that has kept you bound. · Confidence. By the elimination of memories of past failures, you will get the confidence to gain a positive perception of the future. · Personal self-confidence. A lack of self-belief has held many folk back from achieving the best future possible. This is often very true in the business sector, preventing folk with excellent skills from taking the magic leap into a better future. Hypnosis and NLP can help you overcome the lack of self-belief, and motivate you to take a chance and back yourself for a better future. Ø You may have nurtured a life-long dream of running your own business, and although you have the skills and the know-how, have never had the courage to take that vital step to move on from working for a boss. Ø You realise that are about to be offered an excellent promotion in the corporate company where you are employed. This will make a massive difference in your life, and will be a major advancement in your chosen career. You are excited about the prospect, but lack of self-belief, and doubt about your ability to cope, make you seriously wonder whether to accept the potential life-changing promotion or not. These are some of the ways that hypnosis and NLP coaching can help turn your life around by changing your image of yourself, and re-instating your true identity. The underlying principles of hypnosis and NLP coaching. The principles of this innovative coaching program are based on the strong conviction that the possibility of change is in all people. · You are not who are in relation to who your behaviour may dictate you are. If you recognise that you have accepted yourself as that non-person, you become free to change your behaviour patterns, become who you really are, and experience freedom when responses to previously upsetting circumstances are substantially different. · All people have the resources needed to achieve successful outcomes with hypnosis and NLP coaching. The coaching therapy is committed to unlocking these resources. · When you learn how to express yourself and communicate better, the responses from others will be greatly improved. · The mind and body is one system, and the mind has a formation that can be mapped, so that when this is achieved, you will be in charge of your mind, and subsequently your life. · If your beliefs limit you from moving forward, then learn to change your beliefs so that you can advance free from limitations. · Add choices to your life, so that you are able to choose the best option, to ensure that your behaviour always has a positive intention. · Hypnosis and NLP coaching is dedicated to finding ways to deal with old, unresolved issues so that failure can be excluded from your life, and joy restored – enabling you to move forward and accomplish things that never seemed possible before. · One of the most important principles of hypnosis and NLP coaching is to show you how to look forward to the rest of your life with a new, refreshing attitude and take hold of any opportunities life has to offer. · The main concern of hypnosis ad NLP coaching is to help patients access and unlock the unconscious mind, where so much of the life potential in areas of business, sales, health, sport, education and learning, lies dormant. These are the chief principles of hypnosis and NLP coaching, which an experienced therapist can help you to achieve so that the intricacies of your mind can be reorganised. Does hypnosis and NLP really work? There are people who are somewhat sceptical about the successful application of hypnosis as a medically-recognised treatment for mental issues. Folk who have managed to put scepticism aside and opted for hypnosis and NLP coaching to help deal with their particular issues, have experienced life-changing benefits. · Sandy. The coaching helped me to deal with old issues that were holding me back. I am now moving forward in a positive way. I feel better able to make decisions and take control of my life. · Peter.I leaned to perceive more clearly, and respond always with reason. And most of all, I am accomplishing things which I never dreamed possible. · Michael.I came away from my coaching sessions looking forward to the rest of my life. It is now my aim to make the most of any opportunities that come my way. · Liz.I have always had a pathological fear of flying which seemed to rise up from my inner being. Hypnosis and NLP coaching enabled me to deal with this phobia, and I was able to fly to Europe to visit family in a calm and positive state of mind. · Andy.Procrastination and a lack of self-confidence was my problem. The coaching showed me how to follow through with my plans and actually get things done. · Peta. An issue that I had been firmly holding onto for 20 years stopped me from making any changes in my life. A friend advised me to try the hypnosis and NLP coaching method. I made the appointment for the coaching and have never looked back. Don’t even think about the issue any more. · Paul. My partner broke up with me and I just got to feeling that no matter what I tried to do, I was just no good at anything. My confidence and esteem took a nose dive. After reading an article about hypnosis, I decided to give it a try. I opted for hypnosis and NLP coaching and after a few sessions, began to feel better. It was a great experience and I am truly free from all the old stuff. Hypnosis and NLP coaching for treatment of mental, or mind issues, has steadily built up an excellent rate of successful results, verified by the numerous success stories of many happy clients. The different techniques of hypnosis and NLP coaching. Dr Richard Bandler is best known as one of the co-creators of NLP, and with further research developed certain sub-modalities, or techniques, for use with NLP coaching. One of these NLP sub-modalities is known as the swish technique, orthe swish pattern, and both are the same thing. Swish works very well in tandem with hypnosis and NLP coaching treatment. The NLP swish technique is very powerful, and once treatment begins, you can quickly deal with negative thoughts that are getting in your way. What exactly is the NLP swish pattern? The NLP swish pattern, combined with hypnosis, helps you to create an automatic, positive response to a certain trigger, which previously resulted in a negative response. The NLP swish technique eliminates the need for you to struggle with negative thoughts by steering your brain in a different direction of thinking, and teaching you to respond in a different way to negative thoughts. Every memory, whether good or bad, has emotions attached to it. Hypnosis and NLP swish technique, allows you to identify which triggers cause bad memories, to surface, and teaches you how to change your response. For example, a certain memory may always have triggered helpless anxiety, and a pattern of negative behaviour – NLP swish can edit this emotional response, and replace it with a new, positive response. How does the hypnosis and NLP swish coaching work? This technique aims to guide you to a new way of thinking, feeling, and behaving. At the same time, the therapist will help you to identify just what the problem is, and how it originated. · You must know the exact behaviour that you want to change, and want replaced with a new positive mindset. · Examples of this may be a lack of motivation to exercise, a poor diet, no self-confidence to meet new people, a fear of speaking in public or even expressing your opinions, and perhaps an unreasonable fear of always failing at whatever you try to do. · You will need to pick a specific problem before you move on with the NLP swish pattern, as the problem is more than likely to have a certain trigger which causes the way you respond to the stimulus. 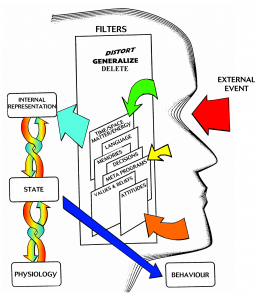 · Acknowledge that your problem behaviour is automatically triggered as a result of a specific memory. This acknowledgement means that you do not consciously intend to act the way that you do, as it is simply an automatic response which needs to be changed. Once the therapist is satisfied that the preparation work has been done, the hypnosis and NLP coaching swish technique can begin in earnest. How the NLP swish pattern can be used for your benefit. The NLP swish technique has a basic aim of replacing unhappy, traumatic emotions and negative behaviour, with more positive emotions, and more favourable behaviour patterns. · The unwanted thought. This is the negative thought or trigger which is in the unconscious mind that provokes irrational behaviour. · The anxious feeling.Unwanted thoughts lead to anxious feelings, and anxiety influences all decisions you may want to make, leaving you at the mercy of your subconscious mind. · Replacing the unwanted thoughts. Hypnosis and NLP swish pattern therapy can help you to replace upsetting thoughts and memories, which cause you to react the way your subconscious mind believes is the appropriate way to act, based on your feelings. By accessing the unconscious and subconscious mind, the negative thoughts are replaced by thoughts which make you feel enthusiastic and confident about your life. When you have identified the specific behaviour and problem you want change, the more intense your feelings are about it, the more intense and successful the outcome of the NLP swish pattern coaching will be. For most people, memories are usually in the form of images or pictures in our heads. Research has shown that with positive visualisation, hypnosis and NLP swish pattern coaching, can help you change the impact of certain memories. Some can be made bigger, and others can be made smaller. This is a tool which works to your benefit in two ways. You can learn to make good memories clearer and better, and also learn to make bad memories weaker, so that they are eventually pushed right out of your mind, which will make you feel a whole lot better. You can expand on the good memories, make them larger than life like how wonderful the weather was, and how calm and peaceful you were at that time – and much more. Dealing with memories is used with another NLP technique which is compatible with the swish pattern. This is the visualising technique which enables you to plant new memories in the subconscious mind. The therapist will ensure that you are in a fully relaxed state before proceeding with the NLP visual coaching. You need to be certain of what memory you want to replace, and which of the negative emotions you want to change. For example you may have wanted to venture out into a business of your own, but a memory of having once failed has resulted in an image of yourself as a dismal failure, which is firmly fixed in your mind. When you think about having your own business, this is the image which takes over your imagination and holds you back. The NLP and hypnosis visual technique will guide you to create new images to replace the bad memories, like seeing yourself as the boss of a successful business, a picture of a functional home office, and an image of profitable sales records which provide you with a good monthly income. The key is to make the new pictures in your mind as vivid, as bright, as happy, and as clear as possible. The more intense the images are, the better your results will be. The negative emotions which once sank your confidence, are replaced by emotions which boost your self-esteem such as feelings of pride that you are actually your own boss, a feeling of confidence that you are destined for success, and happy that you are in control of your own life. Part of the NLP visual coaching is teaching you how to visualise and help yourself if things get tough. The image that you have of yourself in your mind should ideally be one of calmness, confidence, and clarity. This “perfect” image gives you a structure to call on when you encounter difficulties that threaten to overwhelm you, and all you need to do is close your eyes, and use your imagination to access the new picture of yourself planted in the subconscious mind. When you know how to use it properly, the imagination is one of the most powerful tools you have. Pictures and feelings should never be separated, and you get to choose the self-image you want to implant into your sub-conscious mind. It must always be associated with the positive response that you want to experience when you sign in to your new image. You can use the NLP visual coaching for almost any situation which may be causing you hassles. Perhaps you need to get outside and clean the pool, and lack the motivation when you see all the leaves and sand in the water. It doesn’t look great and you have a bad, guilty feeling about not doing the job. This is the time when you can click in to your subconscious mind and use your imagination to picture a clean, sparkling pool. This engenders good feelings and with the end result firmly in your mind, get busy with the pool-net and vacuum to achieve the goal. This is just a simple example which can in effect be applied to anything in life, from small changes to larger issues like anxiety and fear. You can use the visual power of your imagination whenever you feel emotionally threatened, and bring the perfect image of yourself into your conscious mind, so that you have a positive, calm reaction to the issue. Hypnosis and NLP coaching with the NLP sub-modalities Swish Pattern and visualisation, is a very successful program which is of great benefit to folk who are plagued by bad memories, unresolved trauma, a very poor self-image, no self-confidence, and are unable to move on because of chronic self-doubt in their abilities. The hypnosis and NLP coaching therapy offers professional guidance in accessing and eliminating limiting beliefs right where they originate, and are stored in the subconscious mind. NLP is a powerful process for restoring and healing that which is broken.